We are an International Class, a full International Sailing Federation (ISAF) Class, and one of the leading Class Associations in terms of activity and numbers of members in the United Kingdom and Ireland, with members also in the USA, Sri Lanka, South Africa, Australia and elsewhere. The association magazine is published twice a year and sent to the entire membership of the International GP14 Class Association, currently over 1,300, and is read by many more people who are interested in the products and services YOU have to offer. It is also distributed to sailing clubs and yacht clubs all over the world. * Pamphlets weighing more than 15 g may be surcharged to cover the increased cost of postage. 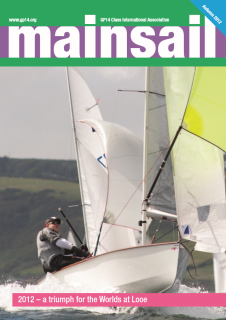 If you are interested in advertising in Mainsail please ring the office on + 44 (0)1204 590 325 or send en email to [email protected]. The Association website is a important tool for both members and for the Association in promoting the GP14 class. This website is updated constantly and is a first visit for most of the GP14 sailors when surfing the web. We have 3,500 registered users on the site and this is growing every day. Web-banners can be a valuable tool in increasing brand awareness and sending traffic to your own website. If you need more information please contact the office on + 44 (0)1204 590 325 or send en email to [email protected]. Banner size = 700 x 90 pixels. We are happy to change your banner once every 3 months over the advertising period, if you wish. In addition to your advertising banner you can also submit editorial content to us once per calendar month to appear on the home page as a news item, and categorised as “sponsor update”. Please note that these prices do not include any design consultancy.